A descendant of Carrie’s, Randy Blood, has recently gotten involved in this research project. He has been searching through old newspapers and found some really great treasures he is sharing with me. The first one I will share with my readers is the death notice for Laton Kanistanaux published in a local New York newspaper. Word has been received that Dr. Laton Kanistanaux died at the home of his grandson by marriage at Evergreen, Colo., Sept. 2. Dr. Kanistanaux had been a resident of Stockton for 35 years leaving last October to make his home at the above named place. He had been in poor health for three or four months. He is survived by one son, Isaac. 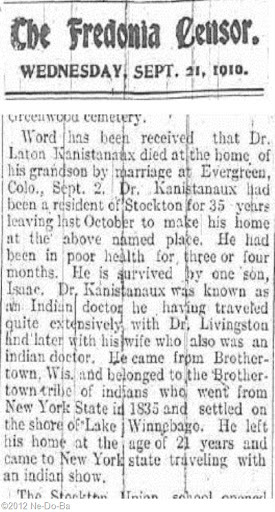 Dr. Kanistanaux was known as an Indian doctor he having traveled quite extensively with Dr. Livingston and later with his wife who also was an indian doctor. He came from Brothertown, Wis. and belonged to the Brothertown tribe of indians who went from New York State in 1835 and settled on the shore of Lake Winnebago. He left his home at the age of 21 years and came to New York State traveling with an indian show. I wonder who provided this information to the reporter? Cousin Lewis is still in town and William’s first wife and kids are in Stockton. Henry (Isaac) is not far away. I suspect it was Henry or Lewis that provided the interesting biography. I find it very interesting that only Isaac (Henry) is mentioned as a surviving child. What about the girls, Carrie and Lee-o-netto? They are both still living. Why aren’t they mentioned? Isaac (Henry) is also the only child mentioned in Laton’s Claims Application. Could Henry really be Laton’s son by birth? Everything indicates Henry was born in Canada about 1860. Laton married in Wisconsin in 1857 and Purcell was born in January of 1858. Laton appears to be in Wisconsin in late 1861 or very early 1862 when his name appears on military enlistment rolls. Only Henry and his mother needed to be in Canada at the time of his birth. I suppose it is possible Laton left after Purcell was conceived and then returned to Wisconsin after Henry was conceived. The notice says Laton left home at age 21. This can not be correct. He was born in 1833. He was 21 in 1854 or there about. If he left at 21 he was back by age 24 when he married Almira in Wisconsin. William is mentioned as “his grandson by marriage” which seems unusually specific to me. I wonder why? Regardless of why, it is a very useful bit of information. It makes it clear that William is not related to Laton by birth. He is a grandson of Laton’s wife, Marleah. Now if I could only figure out who William’s parents are – and who Marleah was married to before Laton! The notice states that Laton was making his home in Evergreen. This suggests he did sell his land before going to Colorado the previous year. Land records are certainly worth looking into. The notice doesn’t tell me anything about when or why Laton changed his name to Kanistanaux. The notice doesn’t say that Dr. Livingston was an Indian, but he likely was or at least promoted himself as an Indian. I will have to take some time to see if I can turn up anything about him. On the other hand, it may just be another “story”, since there is a rather famous Dr. Livingston who was frequently mentioned in newspapers. Once again a wonderful little treasure that creates more questions then it answers. Ah, but that is what makes it so much fun!